For me, choreography is a multi-phase project that I both love and dread. Every time I create a new dance, I start in my head. I get my brain wrapped around the music, find the structure of the dance, decide on a story. Then I make notes about what sorts of movement I want to incorporate. I visualise the dance, sometimes drawing pictures with sweeping arrows and little hoops. And then I get out of my head and into my body as I try dancing what I visualised and seeing if it fits together. Often it doesn’t. Videos monitor my progress and show me what works and what needs to be changed. Once I think I have a section, I make sure I can dance it without my brain at all. If it feels good, it’s a keeper. Otherwise, back to the drawings. I started the WHD Dance choreography yesterday. 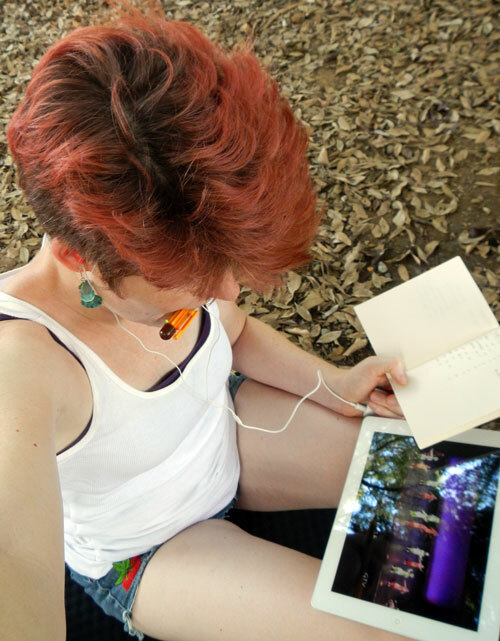 I spent the sweltering afternoon in the park with my choreography tools: iPod, iPad, notebook and colored pens. I put the song on repeat and did the breakdown of the music: verse, chorus, bridge, four 8-counts, eight 8-counts, an accent, a break. 110 measures in total. Then I watched some favorite dance videos with my dance music playing – this always unlocks some ideas and yesterday was no exception. Today I’m off to a mirrored studio to see if my ideas are going to work. Starting next weekend, I am gathering a group of hoopers to start filming the tutorials. Once I get started, it goes quickly. You will see some interesting new concepts in this year’s WHD Dance: group work, formations, more real dance moves. Your feet are going to get fancy and you are going to love the rehearsals! It’s going to be spectacular performance for your World Hoop Day event on 12/12/12. I guess that desire to go outside my comfort zone is what keeps me doing hoop choreography. That, and the chocolate I bribe myself with. There’s a bar of Toblerone waiting for me after today’s studio session. ← Spin Matsuri Shirt Design?